The travel industry is on the verge of a virtual reality revolution, with new 360˚ video technology giving travellers the chance to sample their next holiday destinations virtually, leaving them eager to visit in real life. The virtual holidays can be viewed with computers, mobile devices, and VR headsets like the Oculus Rift & Samsung Gear VR. Leading VR company Rapid VR partnered with one of the world’s largest airlines, Qantas, Samsung, and Hamilton Island, to transport viewers to the Great Barrier Reef. 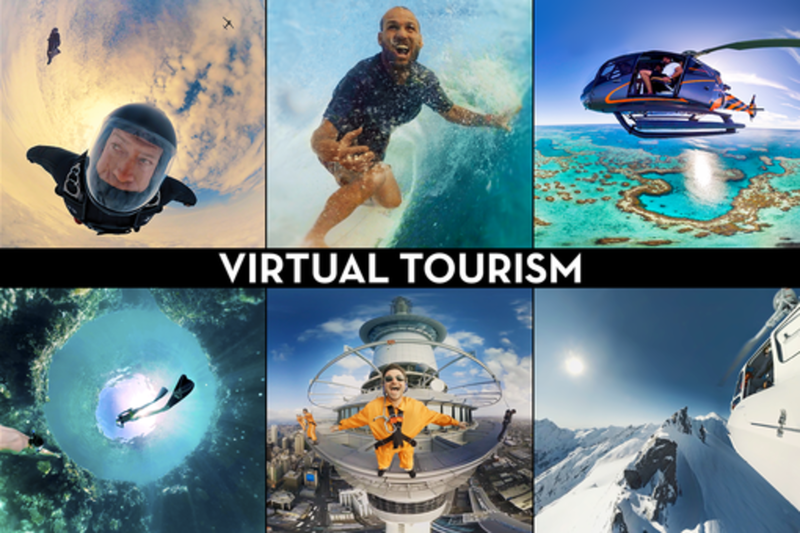 Join the panel to find out how your brand or travel destination can use VR & 360 video to create virtual tourism experiences that lead to real travellers engaging with your business. As director of technology at Rapid VR, Dan has helped placed the Sydney Australia based virtual reality company at the forefront of immersive entertainment and 360˚ film production. With a filmmaking background in post-production and new media technologies, Dan graduated from University of Technology, Sydney, where he studied Media Arts & Production. Dave Klaiber is a multi-award winning film & TVC director. As co-founder of Rapid VR, Dave is an experienced director of immersive 360˚ films, including the virtual tourism experience for Qantas, Samsung & Hamilton Island. Dave co-directed Samsung's “LifeLIVE” campaign, which documented the world's first virtual reality birth, showing the transportive power of virtual reality with the Samsung Gear VR and 360˚ live-streaming technology. The project went viral, grabbing international headlines and millions of hits online. Other VR highlights include filming 11-time surfing world champion Kelly Slater in 360˚, directing the first VR snowboarding film with Olympic Gold Medallist Torah Bright, and creating a Melbourne Cup VR experience for G.H. MUMM. Outside of VR, Dave has worked with every top creative agency in Australia & New Zealand, directing award-winning TV commercials for the biggest brands. His industry accolades include Cannes Lions, One Show pencils, D&ADs, & AWARDs. David is part of the Digital Innovation team at Qantas. With a marketing, communications and digital background, David understands the value in providing innovative digital solutions across Qantas' customer touch points to drive profitable transformation and brand results while leading in the digital economy. At Qantas, David has managed a number of digital innovations that have positioned Qantas as an innovator and enhanced the Qantas Group brand and reputation with customers, employees and the Australian public. He is responsible for building competitive differentiation by making Qantas innovation a key driver of choice for customers. Prior to joining Qantas, David worked in a number of blue-chip companies both in Australia and overseas. While at Thomson Reuters in New York, David managed marketing communication campaigns to drive results for the Financial and Risk division in North America, while championing social enterprise and CRM solutions in the cloud. Susannah Dilallo is an experienced TVC executive producer from Sydney, Australia, and co-founder of Rapid Films and Rapid VR. Prior to this, she worked as a producer at Saatchi & Saatchi New Zealand.